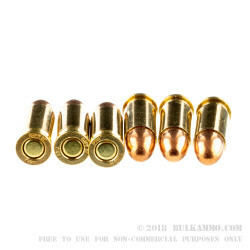 A great target round for the .25 ACP cartridge, this is a Prvi Partizan load that has a FMJ build and is very good for the money when you don’t need specialty ammunition for defensive scenarios. The Serbia based Prvi Partizan has been making ammunition for nearly 100 years, offering a great price point on military and law enforcement cartridges that are now mainstream shooting calibers. 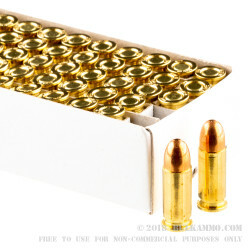 They have recently begun to produce more mainstream cartridges to expand their product portfolio. 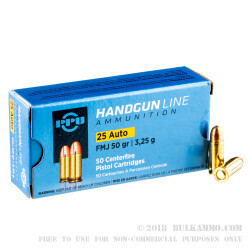 This .25 ACP is a great option for those who want to shoot bulk ammunition as it is a full case of 1000 rounds (20 boxes of 50 rounds in each box). The price is excellent – this is not news to anyone who has shot Prvi Partizan in the past. The .25 Auto is a fun round to shoot and offers good reliability because it is a centerfire round, though many shooters are not super impressed by the ballistic performance of the round which can be a bit anemic for defensive purposes. It is an easy to shoot and easy to love target round though, especially for smaller shooters, new shooters, or those who prefer low recoil. The recoil is virtually non-existent.